At a University of Michigan varsity field hockey game today (UofM vs Temple) a small group of "pioneer women athletes" were honored by an introduction during halftime. The group has been granted honorary athletic letters for their participation on the field hockey team back in the 1960s. Up until some time in the later 1970s women at the University were basically second class citizens. Womens sports were club sports, sort of sponsored by the university, but not recognized or financed in the same way as the men. In the sixties, even the cheerleaders and the band members were all male. A fall football extravaganza was a completely male event. One woman doctoral candidate, Sheryl Szady, used her research opportunity to find the women athletes from those early days and persuade the powers that be to recognize us as pioneer women athletes. 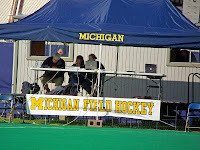 I played field hockey all the way from my freshman year through several years of graduate school. After more than forty years, today, I received a letter jacket. That's me in the photo, on the left. 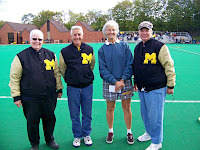 The others are Chris Schneider, Cheryl Barkovich, and Mary Hensel, who all played field hockey in the late sixties. I was not any sort of super player, but I loved the game and for me, autumn leaves meant field hockey. My mother started showing me and my friends how to play when we were still in grade school, which went to eighth grade. Then, I played all the way through high school, college, and graduate school. I only stopped playing when I started buying horses. Those girls today had all kinds of advantages we didn't have - we played on a grass lawn behind the dormitories, a place where we sometimes had to beg boys to leave and toss their football elsewhere. The girls today played on astroturf, or at least some kind of special surface, a surface that had to be watered down during halftime, a surface that has a wonderful give and bounce to it. They have a shelter over their bench area - we just put our stuff on the ground near the field. They have an announcer stand - with an announcer - and an electronic scoreboard. Well, in addition to the physical changes, the game rules have changed so the game is faster, and the players were so fast my camera missed every significant play. We had to leave during the second half because my mother was getting cold, Michigan was ahead 3 to 0 when we left. We went from the hockey game to the farm. I drove the car through the overgrown pasture and hayfield back to the woods. I think I showed the woods to my mother once, about twenty years ago, when I hauled the family back on a haywagon pulled by my antique tractor, but she doesn't remember that adventure. I have been talking so much about having trees cut that I wanted her to understand where they were coming from - she really doesn't like the idea that I'm allowing a single tree to be cut down, let alone forty trees. I couldn't drive right into the woods, but I'm hoping she realized that twelve acres of trees is a whole lot of trees. I don't know how Gibby could tell we were at the farm when he couldn't see us way over beyond the orchard, but he seemed to be barking in an extra excited way when we pulled into the driveway. The cats were also strangely excited. They were scattered all over the yard, from the farmhouse, across the driveway, and all over the woodpile. No one could be unhappy watching two dozen cats and kittens fly in all directions before they all decide to race toward the gate. I picked up the fluffy little gray kitten and then another little gray kitten. For the first time, Fluffy started to purr. I got another burr pulled out of her fur, but there is still a wad mashed into her back fur. I'm hoping Gibby never hurts this one. 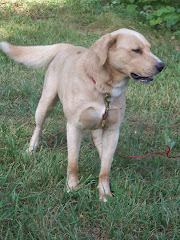 Gibby was a complete gentleman when I opened the gate and held him back so I could clip the cable on his collar. He ran and jumped around and three times headed for me - he came so close I was catching my breath. Then he dove into the grape vines near the house, I thinking looking for his kong toy. I found the kong over by the picnic table and we played catch for a while. Gibby is a real tease, he pretends he's going to give me the kong, then he tosses it where he can get to it first. After several teasing tosses, he finally lets me have it. I wished I could play this game with him until he was tired (although I'm not sure he ever gets tired), but my mother had been pretty patient all afternoon, so I knew I should hurry. Gibby ran around the trees and played by himself while I was feeding the chickens and giving the cats a second feeding (it seemed to me there were more cats than usual today.) I really hated to leave him. He'll get shortchanged tomorrow, too, since the pioneer athletes will be honored again at a luncheon.